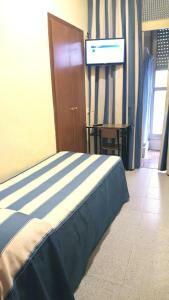 Located behind Sant Jaume Square, this guest house is located in Gothic neighbourhood of Barcelona. The nearest metro station is Jaume I, which is only 5 minutes’ walk. Pensión Coral offers rooms with free Wi-Fi and a 24-hour reception. Some rooms have a shared bathroom, while all of them include a fridge, a hairdryer and free toiletries. Featuring simple décor, rooms at the Coral include a desk and a wardrobe. Some rooms also have a balcony with street views. The Pensión has snacks and drinks vending machines, and a computer with internet access for an extra cost. 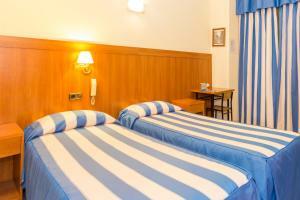 Surrounded by bars and restaurants, the accommodation is within walking distance from places of cultural interest. Picasso Museum is 600 metres away, and Santa María del Mar Church is 6 minutes’ walk. This room has free Wi-Fi, and comes with a fridge, a wardrobe and a desk. The private bathroom includes a hairdryer and free toiletries. This room with free Wi-Fi includes a fridge, a wardrobe and a desk. The shared bathroom includes a hairdryer and free tolietries. This room with balcony has free Wi-Fi, and comes with a fridge, a wardrobe and a desk. The private bathroom includes a hairdryer and free toiletries. This room has a private bathroom with a hairdryer and a towel dryer. This room has a private bathroom with a hairdryer, free Wi-Fi and a fridge. Rate: € 37.90 ... € 71.91; select dates below to get current rates. Rate: € 28.89 ... € 75.00; select dates below to get current rates. 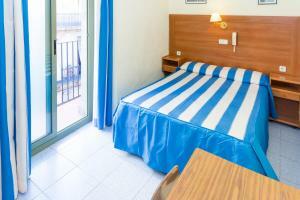 Rate: € 26.39 ... € 66.73; select dates below to get current rates.